Zombie Bank - What Does It Mean? 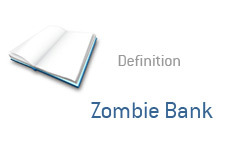 What is the definition of a "zombie bank"? What does the term "zombie bank" mean? The term "zombie bank" was first introduced by Edward Kane in 1987.
c) the current "Great Recession"
A "zombie bank" is a financial institution that has a negative net worth. These banks are technically insolvent, so how do they remain open? "Zombie banks" survive off of government aid, hence the use of the word "zombie". A zombie is an undead creature that loves to feast on the brains of regular humans - "zombie banks" are also technically "dead" as well, only able to survive if they are able to feast on government capital injections. A "zombie bank" has a large number of underperforming or non-performing assets on its balance sheet. When these assets are properly valued, then very often the bank can find themselves with a negative net worth. There is a constant debate ongoing as to whether or not governments should continue to prop up zombie banks. Even with the help of the government, "zombie banks" are often subjected to bank runs. I mean, who wants to hold their money in a zombie bank? Canada: "The World's Best Financial System"